Edited by Tomaku, Feb 19 2013 - 12:56 AM. It's like nothing I've ever seen! The angles and colour scheme compliment each other perfectly! Though in all seriousness rid the white and add more black; though keep the white antlers and it'd look better. I still like it, but everything can look or be better. Edited by TechnicRage, Feb 17 2013 - 09:44 PM. Of all the BBCC#64 entries, I never saw a hybrid one before. I like your color scheme a lot, and how he's all bulked up. Oh, and the Matatu too. A suggestion I could make is try to change the forearms a bit, but that's all and good luck. I've also never quite seen a mixture of these to species either. I really appreciate unusual crossbreeds and this combination works surprisingly well. Only one question comes to mind. Where did you get the light blue Mata hand. I have never seen it before, so just wondering. They were in at least five sets.EDIT: Actually eight, counting these three which go by a different Element ID. Edited by Aanchir: Rachira of Time, Feb 18 2013 - 08:20 PM. The Scuba set had what I was looking for. Toa "Mata" hand, like Tahu's, Lewa's and Pohatu's. Geez, I haven't posted in this forum in forever.Anyway, I like this MOC. The head is definitely my favorite part. I love how it's both rhino and elk combined together--never would've thought of doing that, but they really work well together, I think. 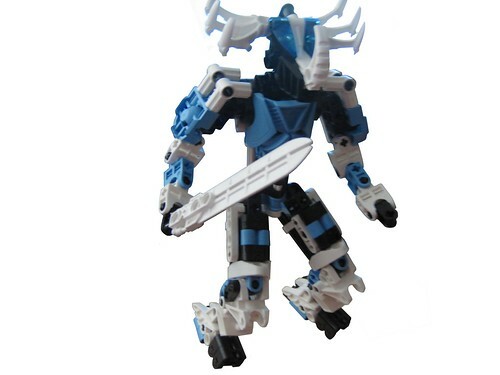 I agree with Chols about the feet/hands; they compliment each other nicely, and add to the overall rhino/elk feel.The one suggestion I'd have besides what others mentioned would be to get a little more white into the torso. The colors are pretty well-spread otherwise, but there does seem to be a lack in the torso. Of course, the large mask takes up a lot of that, but perhaps you could make the black "hand" piece white?Overall nice job here. Looks really good. =] Good luck in the contest! Good color scheme, some good ideas in the limbs and torso. Always tough to do something new with arms and legs, but you seem to have done so, particularly with the shoulders. The white triangle type pieces on the thighs should be turned around. The thigh in this kind of MOC should be rounded and its own unit, the curve of the triangle piece here messes up the overall outline of the thigh. 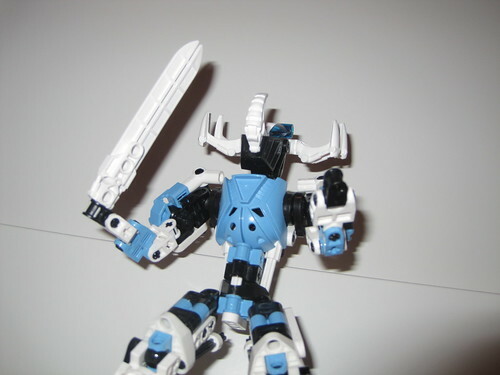 You have to be very careful how you put a head on shoulders, particularly in an animal-humanoid combiner MOC. It would probably be a lot more convincing if it was attached more Onua style, with the neck coming straight forward from the top of the shoulder. Look at how a real rhino and a real elk's shoulder-head arrangement is. That kind of tweak can help you tons, it's a silhouette thing. Some cool stuff going on with the feet here. Kind of a high-heel shoe thing though, which you'd probably like to avoid if possible. Trying to integrate the heel more with the rest of the foot would help, and possibly making the color of those two segments the same so that they don't seem so separate. Color blocking can be used to visually merge pieces. 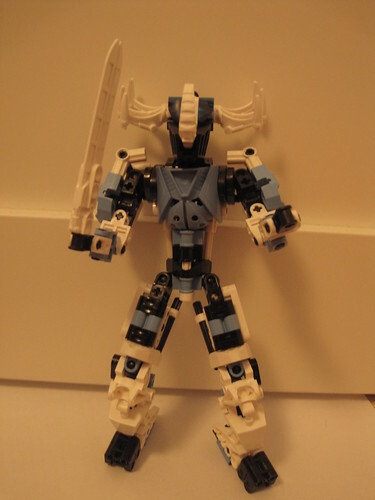 If you wanted to bring it more out of the classic Toa genre into a more unique animal-humanoid genre, you should heavily alter the anatomy. The neck-shoulder thing is part of that, but you can also do such things as gving him a second pair of knees, making the shoulders way wider than the hips, bending the torso into more of a semi-circle, and things like that.